Sauber’s Esteban Gutierrez has been handed a three-place grid penalty for his part in a crash with Lotus’ Pastor Maldonado during yesterday’s British Grand Prix. The pair, who famously came together at the Bahrain Grand Prix earlier this season, made contact during an overly ambitious overtake by Gutierrez who outbraked himself, before hitting and launching the Lotus. Stewards placed the blame with Gutierrez, who retired from the race due to damage sustained in the collision, and handed him a three-place grid drop for the upcoming German Grand Prix. Maldonado saw the lighter side and commented on how he was told the crash looked “spectacular”, and said that the team were not sure if the crash led to his retirement on the penultimate lap, but did add that the rear wing was moving around more than usual, so there must have been some damage to his car. 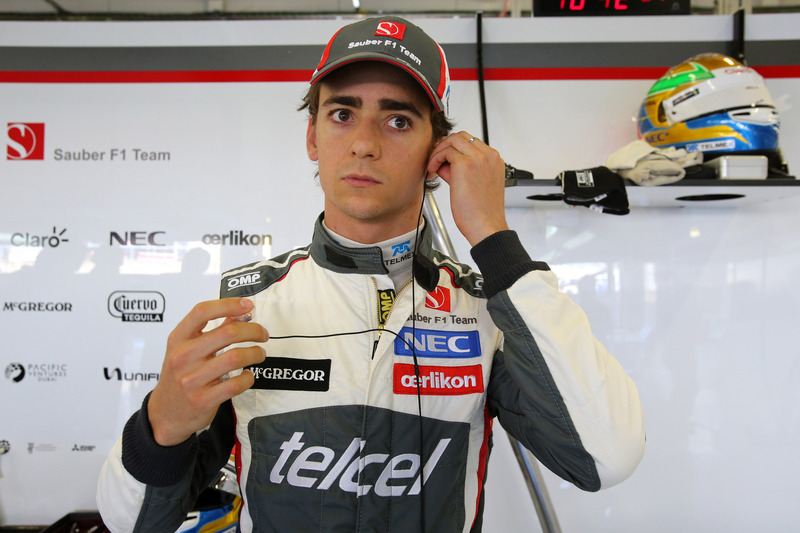 Gutierrez took a ten place grid penalty at the British Grand Prix also as a result of an unsafe release at the preceding Austrian Grand Prix. The F1 circus remained at the Circuit de Catalunya today as the second day of the second in-season test got underway. At least, it got underway for everyone excluding Caterham who announced that they would not take part due to the damage sustained in Kamui Kobayashi’s crash on Tuesday. 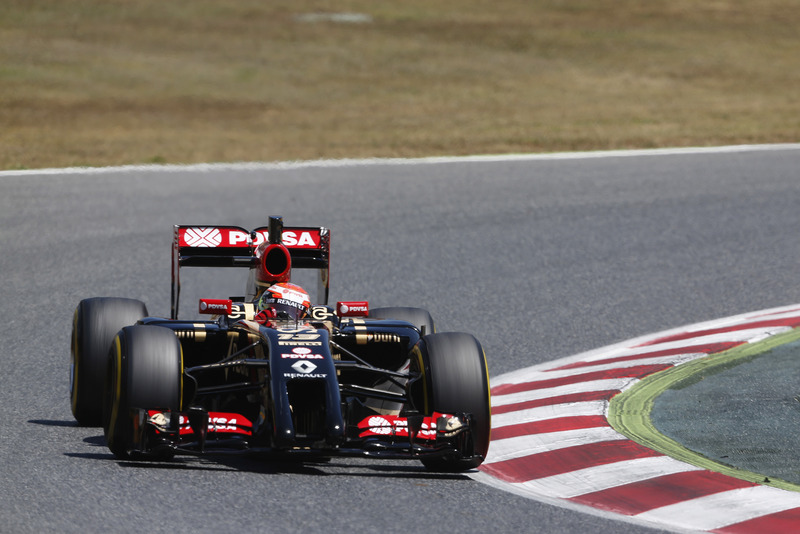 Of the ten remaining cars, it was Lotus’s E22 that went fastest today, piloted by Pastor Maldonado. The team praised their “trouble-free and extremely productive” test which saw them complete 102 laps and set a fastest lap of 1.24.871. Nico Rosberg finished second for Mercedes and his run included testing the team’s trial ‘megaphone’ exhaust system, but after also setting 102 laps, the German reported that: “Just tried the new exhaust system, but [it] didn’t work out. [It] didn’t make it much louder. We’re pushing for another solution”. Kimi Raikkonen was back in the car for Ferrari and his 94-lap test followed yesterday’s short run where he completed a mere 20. The Finn was followed by Sauber’s Esteban Gutierrez had his run interrupted by a powertrain problem, but Test Engineer, Paul Russell, insisted that this did not cost the team too badly. He ended his running in fourth, over two seconds behind Maldonado’s quickest time – although Gutierrez did not sample the super-soft tyre compounds. Susie Wolff was one of the few to test the quicker Pirelli tyres, but her running was limited following a red flag-prompting spin at turn 11 about an hour into her run. Despite the unplanned break, Wolff completed her run plan by lunchtime, leaving the afternoon session to just familiarise herself with the car. Jules Bianchi was sixth for Marussia who topped the timesheet with Chilton on day one (although his super-soft fastest time was 1.6s behind that set by Maldonado today). His lap time was a second behind that of his team-mate, although he did not use the softer and quicker tyres. Force India test driver Daniel Juncadella took the VJM07 out today but hit the barriers at turn 4, which, obviously, limited his track action. Nonetheless, Chief Engineer Tom McCullough said: “He gave useful feedback on the tyres and general car performance,” and concluding that, “overall it was a successful test”. McLaren also ran their test driver Stoffel Vandoorne today, and his 136 lap run proved to be the longest run of any team this test. Daniil Kvyat was tenth for Toro Rosso and caused two red flags through his 21 lap run. Image courtesy Lotus F1 Team. Sky Sports are reporting that Gene Haas will visit Lotus’ factory in Enstone next week. The exact reason for the millionaire’s visit is not known but the obvious assumption would be that he is looking to buy the team ahead of his planned entry into Formula One next year. Gene Haas was given permission in March to enter a Formula One team, Haas Formula, with a planned debut between 2015 and 2016. Haas has said that he wants to base his team in America but the logistics of this are not too ideal and the 11 existing factories are located in western Europe for ease of access. For this reason, Lotus’ Enstone base would be ideal for a team. It would also make sense for Haas to buy an existing team rather than endure the pain of starting a new team. The last time a new team arrived in F1 was in 2010 when Virgin (now Marussia), Lotus (now Caterham) and Hispania all joined the sport. However, Hispania have sinced collapsed and Marussia and Caterham are no closer to moving towards their first ever points finish. Lotus have struggled so far this season, enduring a pointless run of races – with four retirements and four non-points finishes. The Spanish Grand Prix seems to have brought a turning point though, as Grosjean qualified fifth on the grid for the team. The team remains in financial trouble and a potential deal brokered by Mansoor Ijaz flopped and appears to have been a sham, leaving Lotus resorting to hiring Pastor Maldonado who brings in big money from Venezuelan oil-company PDVSA. 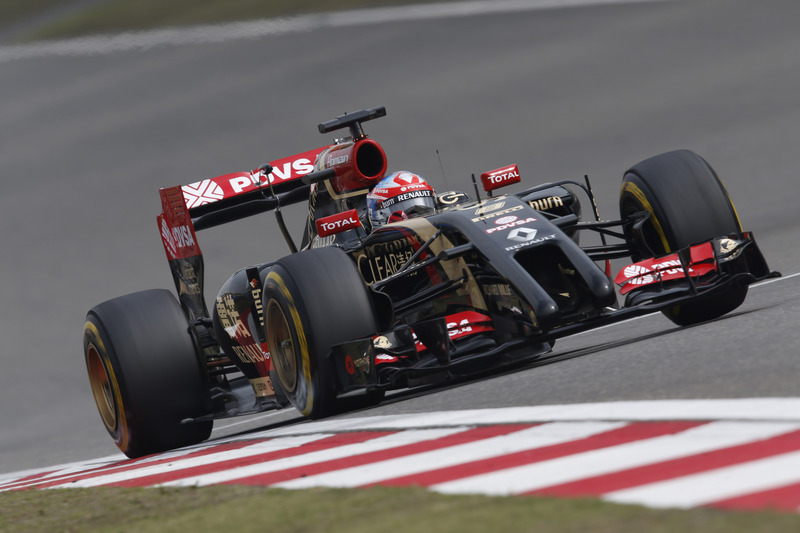 Romain Grosjean will leave China lamenting his bad luck after suffering a gearbox failure during today’s Grand Prix. The Frenchman was challenging for points for the first time this season after qualifying in the top ten, until a gearbox issue saw him lose fourth gear. After struggling to continue, including a deep trip into the gravel at turn 11, he was told to pit to retire the car. Pastor Maldonado brought the other Lotus to the chequered flag, finishing fourteenth after starting twenty-second. He suffered an engine issue during the Saturday morning practice session, and the efforts to repair it meant that he failed to set a lap in Qualifying. Lotus F1 Team have announced Frederico Gastaldi as Deputy Team Principal. The Argentinian will take up his new position immediately, coinciding with Free Practice 1 of the Australian Grand Prix which kicks off the 2014 season. Gastaldi has worked with Lotus since their Renault days, joining the Enstone-based outfit in 2010 and working as Director of Business Development. “It’s a great honour and I’m looking forward to it,” Gastaldi said today. “The team is an exceptional place to be and the depth of talent is amazing. My approach will be to ensure we get the most out of every aspect of Enstone and harness every talent housed there. “We need to ensure rapid progress with our car for this season.” He continued. “It’s no secret that pre-season preparations have not been as smooth as we’d like but we have confidence that we can turn this situation around very quickly. We need to work as closely as possible with Renault to fulfil our potential. We know it is a big challenge, especially because there is so much technology that is new to everyone, but we know the team can deliver good cars and we will do this in 2014 with Renault. “We are pleased to announce our new Deputy Team Principal,” Team Principal Gerard Lopez said in a press release. “Federico Gastaldi has been a valued friend of the Genii and Enstone families for quite some time. His Enstone history dates back to the Benetton days. “For Lotus F1 Team, Federico was instrumental in nurturing our relationship with PDVSA and he continues to be a vital link for us with Venezuela. Lotus have released the footage of the Lotus drivers, Romain Grosjean and Pastor Maldonado, returning to their Enstone factory ahead of the 2014 F1 season. RoGro was kind enough to give Maldonado a lift to his new home – something which seemed to anger Pastor. Take a look at the video below to see Maldonado like you’ve never seen him before. Lotus Team Principal Eric Boullier has resigned from his post at Lotus. The Frenchman’s departure was announced this morning, mere hours before an image of Lotus’ E22 was released online. McLaren also launched their 2014 challenger, the MP4-29 today, and it’s believed that Boullier could be on his way to McLaren to take over from current McLaren Team Principal, Martin Whitmarsh, following their dismal 2013 season. Lotus owner Gerard Lopez will take over from Boullier as Team Principal with immediate effect. “We thank Eric for all his hard work over the past four years and we are confident we can continue to fight as one of the top teams in Formula 1 over the seasons ahead,” a Lotus press release said today. Gerard Lopez added, “Lotus F1 Team has never stood still and we head into what promises to be an exciting 2014 season with an innovative new car, new partners and a new management structure at Enstone. Boullier’s probable appointment comes just days after Ron Dennis returned to the Woking-based outfit. To see the new McLaren and Lotus cars, click here.